Copper Faraday Cage: A mesh of conductive materials, that protects the armor's systems from electromagnetic radiation (e.g. EMP). Audio/Video Recorder: A device which records both audio, and video. Can store up to fifteen (15) hours of content. Audio/Video Player: A device which displays the recorded audio, and video files. Annunciator: A sound amplification device. Broadband Antenna: A device which allows the user to pick up noises and sounds, on different broadband frequencies from far distances. Sonic Dampeners: A device which limits the amount of sound that can reach the user's inner-ear. Encrypted Comlink: A device that transfers voice signals from one location, to another. Environmental Filter: A device that removes harmful gases, such as poisons, and fumes from the air. Oxygen Filtration System: A device that removes solid particles, such as dust, pollen, mold, and bacteria from the air. Oxygen Supply: A storage vessel that holds three (3) Hours of oxygen. Re-breather: A breathing apparatus that adsorbs the carbon dioxide of the user's breath, to permit the re-breathing of unused oxygen. Combat Scanner: A sensor which employs targeting software, to increase the user's combat efficiency. Life Form Scanner: A device that allows the user to detect living beings from a distance. Multi-Frequency Targeting and Acquisition System: A sensor system which provides assistance in acquiring targets in conditions of poor visibility, and at long ranges. Radar: An object detection system, that determines the range, angle, or velocity of objects. Motion Scanner: A device that detects objects via movement, and displays them on the helmet's radar. Sonar Mapper: A device that emits sonar pulses, to map an area through echolocation. VT-FD Mask: A device that can track a Force User unless they are attempting to hide their ability. IFF Transponder: A transponder signal which broadcasts the user's affiliation. Anti-flash Visor: A visor that protects the user's eyes from bright flashes, such as those emitted by flash bangs. Heads-Up Display: A transparent display that presents data, without requiring the user to look away from their viewpoint. Rangefinder: A device that zooms in on distant targets, and displays visual data of the target observed. Power-Pack: A small power-pack that supplies energy to the Armor's systems. Redundant Power-Pack: A small, redundant, power-pack that supplies energy to critical systems if the primary power-pack is damaged, or disabled. Faraday Cage: A mesh of conductive materials, that protects the armor's systems from electromagnetic radiation (e.g. EMP). Coolant System: An in-built system, designed to keep the user at a comfortable temperature, in high heat environments. Pressurization System: The armor can be pressurized, so as to aid the user in surviving the vacuum of space. VT|ATC-Jump Kit: A backpack that allows the user to move quicker then an average individual through the use of thrust. VT-Disruption Cutter: A hand held device that can slowly cut through most material silently. 2x Energy Sink: A component designed to adsorb blaster energy. Ammunition Pocket: A pocket for storing additional clips of ammunition. Grenade Pocket: A pocket for storing additional grenades. Medpac: A small first-aid kit that contains limited-utility diagnosis equipment and other essential medicines for the treatment of wounds. Field Ration: A prepackaged meal, easily prepared and eaten. Multitool: A device that contains a variety of useful tools. VT-Moph Knife: A small knife that is capable of knocking out an opponent just by touching them, still can kill like a normal knife as well. Multi-purpose Arm Terminal (Left Arm): A light and direct line of communication and Data. Magno-grip Soles: A device that allows the user to magnetize themselves to surfaces which they were standing on. Heavy Armor: Quite simply put this armor was designed to take a beating. Multiple layers of protective gear are tacked onto this. Armor Gaps: In order to allow the wearer some maneuverability the armor has several gaps. Back Plate: When one peels away the jet-pack and parachute located on the VT-Assault Armor one finds a vulnerable position. Fuel Pods: Located on the back of the armor tucked beneath the Jet-pack and chute are two fuel pods. These two small cylinders hold and refresh the fuel for the jet-pack. 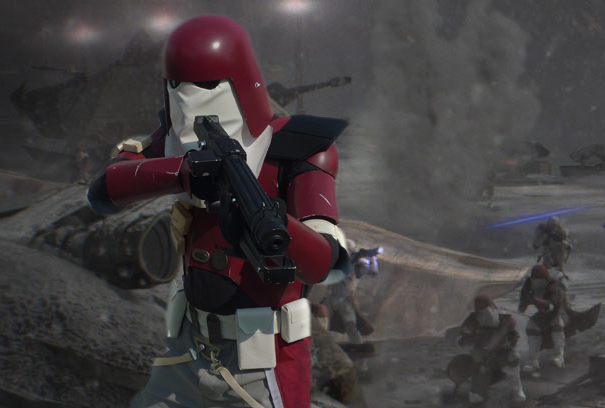 Designed off the already used Republic Standard Armor, the Marine Variant is meant for those who are in the front line of battle. Used mostly for the Marine Corps, in both Space and Ground engagements it is very versatile. Built with the intentions of making a Marine less vulnerable to frontal attacks. This armor is also built to fend off of Force Users with some special features used to fend off Force Attacks. Created with many features to prevent the user from being injured, there are other utilities and features that give them an advantage in the field. Common in all Republic Armor, they are resistance to the Vacuum of Space as well to EMP's and some Ion waves. Special armor polymers and metals were used in the creation of the armor to special protect from many weapons and still be some what flexible. Edited by Tobias Dracks, 21 October 2018 - 10:58 PM. Edited by Tobias Dracks, 15 October 2018 - 01:55 PM. This looks like the affiliation is the Republic Remnant. If that's the case, the affiliation should probably be narrowed, as limited is meant for small groups (such as a specific fleet or army group within the Republic Remnant). Edited to the Marine Corp? Is that what you mean? Just something to think about in the future when making subs.